When I prepared this week’s menu last week I found a new salad recipe which I made today. It was a strawberry and chicken salad with a basil dressing. You can find the recipe here, it’s in Swedish only but I’m more than happy to translate upon request. 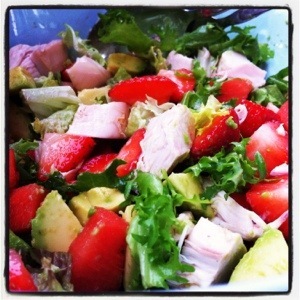 The salad contained strawberry, avocado, water melon, salad (I bought a Mediterranean mix) and chicken. Fantastic for summer flavors!